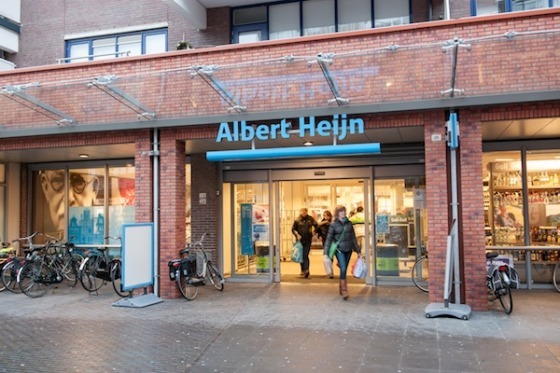 A forecast halt to turnover growth is forcing supermarket leader Albert Heijn into a change of concept for its shops and possible closures, the Financieele Dagblad reports. Ahold Delhaize boss Wouter Kolk told the paper online shopping is partly the reason the shops are doing less well. It is time supermarkets take on ‘a different role’, the FD quotes him as saying. In practice this means that there will be less space for traditional products like pet food and cleaning products. Instead, more room will be made for food-oriented services with kitchens where takeaway meals are prepared, and home delivery services. The move means that a small number of shops could face closure, ‘I don’t think we’ll have over a thousand shops in the Netherlands in future. And we don’t need to. But the number of shops will not fall drastically because they will be needed for direct consumption and a fast delivery service’ he told the FD. The first Albert Heijn with its own kitchen will open in Amsterdam early next year.